Philadelphia Eagles backup QB Nick Foles completed 28-of-43 passes for 373 yards, three touchdowns, one interception, and a touchdown catch to win Super Bowl 52. 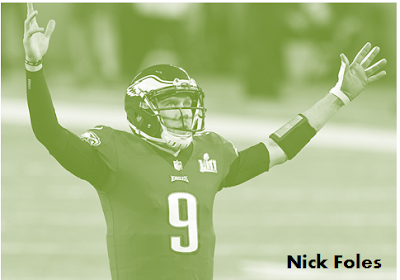 The New York Times reported about Foles' skills in Ultimate Frisbee. Eagles wide receiver Nelson Agholor is quoted: "You've got to see him in Ultimate Frisbee. We do a little conditioning in Ultimate Frisbee in the off-season. This dude's got hands. got routes. Stupid athletic." 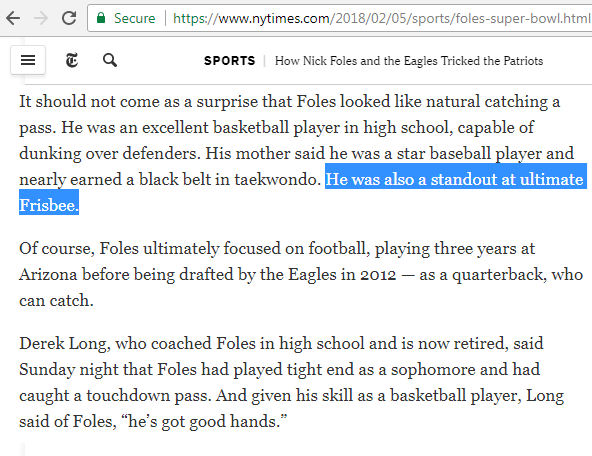 Again, NYT claims Foles as being a standout at ultimate Frisbee. No word on why NYT's first reference to the sport was uppercase "U"ltimate Frisbee, and the second reference was lowercase "u"ltimate Frisbee.